Few shows make it to 14 seasons, and even fewer shows make it to 14 seasons with a cast that's still totally obsessed with each other. Over the course of the show, stars Jared Padalecki and Jensen Ackles have become the best of friends, and so have their wives, and so have their kids. They even live next door to each other. As Ackles told us, "I know a lot of marriages that haven't lasted that long." E! 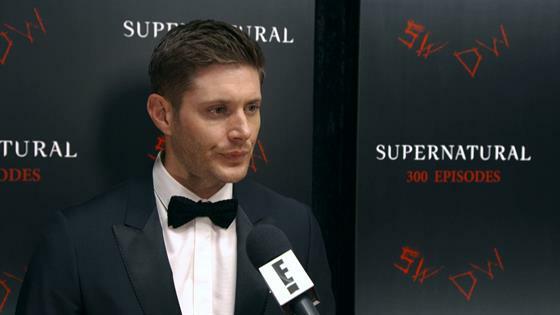 News was at the 300th episode celebration before filming began in November, and we had Jared, Jensen, Jared's wife Genevieve Padalecki, and Jensen's wife Danneel Ackles explain the familial and friendship bonds this show has created, and honestly, you just might cry a little. "We certainly couldn't pick who we got cast next to, and sometimes, you can't pick who becomes your friend, it just kind of happens," Jensen told us. "And we got very fortunate in the fact that we not only got picked to be coworkers, but whatever it is, the universe kind of picked us to be buddies as well, and I think that's really given us a leg up on any issues that we would have run across being costars." "I guess we lucked out," Jared said. "I think Ackles and I found a really cool, unique situation where we truly enjoy each other and we enjoy each other's families, and have each other's backs, and after 14 years spending more time with each other than you spend with your wives, your kids, your brothers, your sisters, your mothers, your fathers, you kinda go one way or the other, and we went to the place where we got closer. So we're just pretty lucky." "We really dealt with it from a friendship level and not business partners, and I think that that's been one of the great things that I've gotten from this show is such a great friend that knows me so well, but also somebody that I can work with on a level that I've never worked with anybody else in my life," Ackles continued. "So we understand that it's pretty rare and may or may not ever happen again, but we're proud of what we created and we're proud of the people that helped us get here." Not only did the show create a friendship, but it built families. Both Danneel and Genevieve have guested on Supernatural, and that's where Jared and Genevieve met, all the way back in 2008. She remembers not quite knowing what she was in for when she stepped on set. "I didn't know what to make of it. There were these two hunky actors who were the leads, and you know, I came from more of a female-centric show and I was like, I don't know what to make of this," she says. "And they were just so fun, so professional, such goofballs, and the camaraderie that was already in place, and how embracing they were of some guest star that no one knew who she was. I think that, for me, really set to the tone of what the show was." "We live next door to Jared and Gen. We love them in real life," Danneel says of life in season 14. "I just think it's so hard in this business to have, I mean, two beautiful men with big egos that actually care about each other and put each other first." Genevieve credits the fact that neither Jensen or Jared have "taken a back seat" and gotten bored or complacent with the show's continuing success, and it sounds like no one is ready for it to end any time soon. "I'm sure that eventually there'll be an end in sight, but it'll be a really tough day when that happens," she says. The 300th episode airs tonight, with the return of Jeffrey Dean Morgan as John Winchester. For more on this love fest, watch the video above.